The leading causes of sight loss – cataract, macular degeneration, glaucoma and diabetic eye disease – are all age related. If your sight is not as good as it used to be, you’re not alone. Sight loss affects 1.8 million people in the UK. RNIB research predicts that by 2050 the numbers of people with partial sight and blindness in the UK will double to nearly 4 million people, and most people find their sight worsening as they get older. Age-related macular degeneration (AMD) is the leading cause of sight loss. It damages the vision at the centre of the eye, causing problems with reading, writing and other close work. However, side vision is retained which helps when moving around. There are different types of macular degeneration. Wet macular degeneration is less common but there are more treatment possibilities. Find out more about Macular Degeneration. Glaucoma is a degeneration of a particular type of nerve cells that results in a loss of peripheral vision and ultimately all eyesight, if untreated. It is more prevalent in older people. There are two forms of glaucoma: open angle, which is painless and may be treated with eye drops to reduce internal fluid pressure in the eye, and closed angle which may be painful as a result of increased internal fluid pressure and may require surgery to reduce it. Glaucoma can be detected as part of a routine eye test. Untreated, glaucoma can cause you to lose parts of your peripheral vision which can make it hard to get around as the disease progresses. Central vision is less likely to be affected until very late stages in the disease. Glaucoma runs in families and is also more likely to occur in people of African (open angle) or Asian (angle closure) origin. Once detected, glaucoma can be treated with eye drops and possibly surgery. Find out more about Glaucoma. Diabetic eye disease occurs due to diabetic damage to the blood vessels in the retina at the back of the eye. It is more likely to occur if you have had diabetes for a number of years, and is most likely to occur if your diabetes is poorly managed. Damage can occur without you being aware of it, or you may have blurred patches of vision. You can find your vision changes from day to day. Once detected, diabetic eye disease can be treated in a number of ways. Find out more about Diabetic Eye Disease. A detached retina can cause a shadow at the edge of your vision or create an effect like a curtain falling over a large part of your sight in one eye. It is more common in people who have moderate to severe short sight because the retina may be thinner than average. You may experience flashes of light or a dramatic increase in ‘floaters’, black dots in front of the eyes, in the run up to a retinal detachment. The condition is not painful, but if you have symptoms like this you should see an ophthalmologist straight away. According to RNIB, smoking is the number one threat to the health of your eyes. It can cause macular degeneration and cataracts, two of the leading causes of sight loss. Smoking can reduce the blood flow at the back of the eye which causes damage to the macula, the part of the eye that is essential for detailed vision. Tobacco smoke contains heavy metals which accumulate in the lens at the front of the eye, leading to cataract. Passive smoking can cause almost as many problems: like smokers, people who have been exposed to other’s smoke over five years almost double their chances of macular degeneration. So, if you are a smoker and want to protect your eyes the first thing to do is to stop smoking. If you stop, the increased risk of eye disease will reverse over time. Talk to your GP or pop in to a pharmacy to find out about stopping smoking with the support of a professional. Poor nutrition can contribute to sight problems, particularly macular degeneration. Vitamins and minerals, known as antioxidants, help protect the back of the eye from chemicals called ‘free radicals’ in our bloodstream. According to one study, taking a specific high dosage of vitamins C and E, beta carotene, zinc and copper could help to ‘significantly reduce the risk of developing advanced stages of AMD by about 25%’ for people who already had moderate AMD. Although this seems straightforward, the dose taken in the study was much higher than usually recommended, and a review of research found no benefit, so talk to your GP before embarking on a course of vitamins. Two antioxidants, lutein and zeaxanthin are thought by some experts to prevent damage to the macula by free radicals. They may be able to prevent macular degeneration developing, and two studies have shown lutein to improve vision. It is not yet certain that supplements containing lutein and zeaxanthin will provide benefits when you have a balanced diet, but studies are taking place to investigate this. Researchers are also looking at the possible benefits of omega 3 fatty acids which are found in fish and may cut the risk of developing macular degeneration or slow its progression. Research suggests that a diet high in polyunsaturated fats, and particularly the consumption of fish that is rich in these fats, decreases the risk of developing macular degeneration and may slow down the progression of this condition from moderate to severe. Vitamins A, C and E as part of a healthy diet may have a role in protecting against cataracts. Don’t start taking lots of supplements: instead make sure your diet is packed with good healthy foods. Excess exposure to UV light plays a part in both macular degeneration and cataract development. Wearing UV absorbing sunglasses or a broad brimmed hat reduces your sunlight exposure and may help reduce the risk of some sorts of cataract and possibly macular degeneration too. Choose sunglasses with the CE marking showing that they meet European safety standards. Sunglasses without this mark may not have UV absorbance and are dangerous to use as they may actually let more UV into the eye. Find out more about Sunglasses. If you have diabetes, try to control it as well as possible. Diabetic eye disease is more likely to occur earlier and is likely to be more severe if your control is poor. Speak to your specialist if you have problems with controlling your diabetes. You should be invited to have your eyes checked every year: make sure you attend as it is easier to treat diabetic eye problems if they are detected early on. A number of people may not be aware that they have diabetes, and could be developing eye disease without realising. If you feel excessively tired without cause, need to urinate frequently and are often thirsty ask your GP for advice. Get more advice on the symptoms of diabetes from the Diabetes UK website at www.diabetes.org.uk. If you are overweight you can have a high risk of eye problems. Obesity is linked to high blood pressure, high cholesterol, diabetes and heart disease. It has also been recently linked to all the leading causes of sight loss, macular degeneration, diabetic eye disease, cataract and possibly glaucoma too. High blood pressure can damage the blood vessels in the retina at the back of the eye. High cholesterol can cause the arteries in the retina to harden and thicken, pressing on and blocking veins. This can cause fluid leaks at the back of the eye and sight damage. If you are overweight or obese ask your GP for advice on healthy and sustainable weight loss. Many eye diseases don’t have symptoms in the early stages so you may not be able to tell that your sight is being damaged. 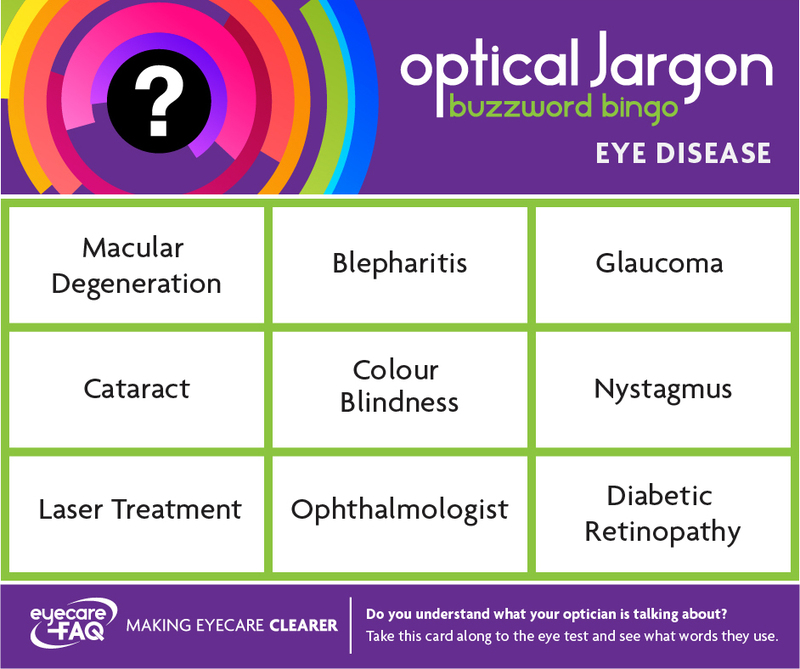 Regular eye tests can help pick up the very early signs of disease. The optometrist looks at the back of the eye to spot conditions like macular degeneration, diabetic eye disease and can even see signs of high blood pressure. Get your eyes tested every two years, or more often if advised. People with a family history of glaucoma may need an annual test. It isn’t easy to go through sight loss; you may feel all at sea in a world that is suddenly unfriendly. Your usual sources of information, leaflets or the Internet, may be hard to access. People who haven’t experienced sight loss may not appear to understand what you are going through, and you may find it harder to get out and see friends, leaving you isolated. Don’t despair: there are services to help. Start by calling RNIB’s helpline, 0303 123 9999. RNIB also offers an emotional support telephone service which is run by a team of telephone counsellors. Talking to a counsellor gives you the chance to share how you feel without worrying about burdening a friend or relative. A counsellor can give you time to talk about your situation, listen to how you are feeling, help you to identify what you need, and help you work out the best way to get it. Through the RNIB helpline or emotional support telephone service you can be put in touch with support in your local area through befriending, or support groups. Everything you share with the trained counsellors is confidential. If you have been diagnosed with eye disease at hospital, they may have a trained worker to help talk you through what you are experiencing. Ask if there is a patient support service or an eye clinic liaison officer. Find out more about Low Vision and the support available.